Jesse Powell was born in 1977 in Los Angeles, California. He has lived most of his life on the California coast, where he has developed a deep attachment and respect for a rapidly disappearing natural landscape. A third generation artist, Jesse's love for art stemmed at an early age, mostly from the influence of his father, nationally recognized artist John Powell. Jesse graduated from the University of Puget Sound with a Bachelors of Fine Arts Degree in painting and drawing, and went on to study Russian Impressionism in the Republic of Georgia under the tutulage of Nicholai Dubovik, Ilya Yatsenko, and John Wurdeman. His education has continued with numerous trips to the Scottsdale Artist School to study with painters such as Matt Smith, George Strickland, and Kenn Backhaus. Jesse's influences extend primarily from the California Impressionists, such as Guy Rose, Hanson Puthuff, as well as the great American, European, and Russian Imp ressionism such as Joaquin Sorolla, Frederick Mulhaupt, and Isac Levitan. Grounded in a traditional approach of executing studio paintings from numerous outdoor studies, Jesse's work has received numerous awards, and has attracted the attention of major collectors such as Joan Irvine Smith and Jean Stern, the Executive Director of the Irvine Museum, which specializes in historical California Impressionism. The past several years have been a milestone for Jesse. Highlighted by Southwest Art Magazine as an Artist-To-Watch, this young artist has already received two First Place Awards in both the Crystal Cove Alliance Invitational exhibit and the Laguna Plein Air Painter's Association member's Show. 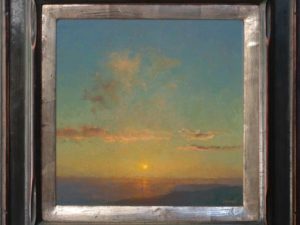 Jesse participates in the prestigious Laguna Art Museum Plein Air Invitational annually and was recently elevated to Signature Membership in the Laguna Plein Air Painters Association. LPAPA Miniatures show, Laguna Beach, 2nd place; Laguna Beach Plein Air invitational, Laguna Art Museum ; Michael Hollis Fine Art, Spring Showcase, and solo exhibitions; LPAPA "Best of Plein Air Show" Honorable Mention; "American Art Collector Magazine", feature article; Crystal Cove Alliance Invitational Exhibition, First Prize 2003; "Southwest Art Magazine", Feature:"21 under 31: Young Artists to Collect Now" Sept. 2004; LPAPA Member's Show, First Prize; The Nassau Gallery, Rehoboth Beach, Delaware, Exhibition: Jesse Powell and John Powell 2002; The Hanging Tree Gallery, Palos Verdes, CA One-Man Exhibition 2002.